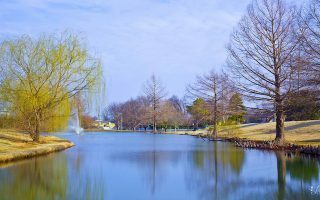 The fertile “Green Country” of Tulsa, on the banks of the Arkansas River, is saddled between the rolling Osage Hills and the Ozark Mountains in the northeast quadrant of Oklahoma. This second largest city in the state was originally established by Creek peoples, but was heralded as the “Oil Capital of the World” in the 20th century. 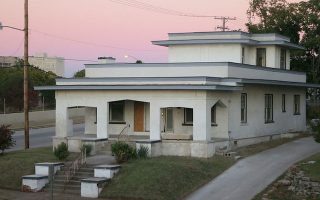 The energy industry remains strong in Tulsa, but the city is also known for its diverse aerospace, finance, and technology sectors, as well as a flourishing arts scene and an abundance of Art Deco architecture. 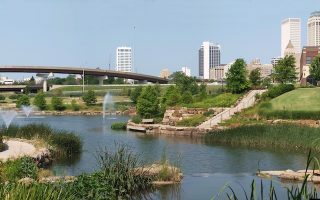 Running in Tulsa is defined by the city’s “River Parks” system, an extensive network of parks and multi-use paths along both banks of the Arkansas River. Just off these central paths, runners can find trail running at the Turkey Mountain Urban Wilderness Area and connections to the Creek Turnpike Trails. For a reliable 5k route, head to the loop around LaFortune Park or find more park running at Mohawk Park. Fun neighborhood running can be found in the Riverview and Midtown neighborhoods, easily accessible from downtown. The Midland Valley Trail is a great connector from the Central Business District to Riverview & Midtown and then the river paths. In addition to these favorite spots, there’s an extensive system of multi-use paths throughout Tulsa — not always the most scenic, but good to know about! See the Tulsa trails map below for an overview. And a shout out to the Tulsa Running Club for their help with this guide! Tulsa is a supremely walkable (read: runnable) city, but if you need to give your legs a rest, the Tulsa Transit provides affordable and reliable busses throughout all major neighborhoods and to/from the airport. There is also a free downtown trolley that circulates downtown on Friday and Saturday evenings. Also note: Tulsa can be hot in summer! The crown jewel of running in Tulsa is the River Park trail system, with about 15 miles of trails on both banks of the Arkansas River. Highlights include a fitness station and the innovative “Gathering Place” park on the east bank. 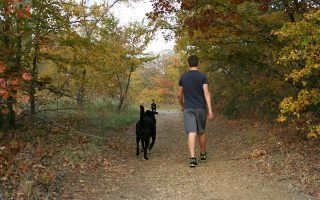 Trail runners will delight at the 300 acre Turkey Mountain Urban Wilderness Area, with miles of scenic dirt singletrack and several loop options. Located on the west side of the river paths at 71st St. 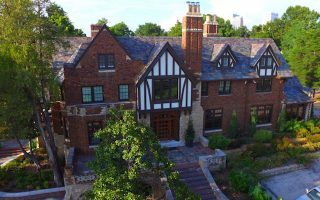 Some of the grandest and most historic homes in Tulsa lie within the Riverview District just south of downtown. We’ve created a 2.4 mile tour of the highlights, but most streets in the area have runnable sidewalks. 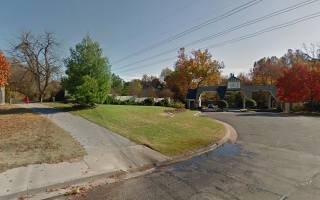 The walkable residential neighborhoods of Midtown make for a nice sidewalk run, whether it’s the hip cafes and vintage stores of Cherry Street, the pretty waterfront homes of Swan Lake, or the extravagant architecture of Maple Ridge. This popular 5k route traces the circumference of LaFortune Park on a paved and crushed stone surface. The park is 8 miles southeast of downtown Tulsa, and has numerous recreational and fitness facilities. 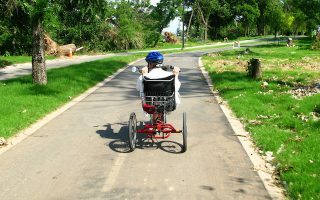 The Creek Turnpike, Mingo, and Liberty Trails are paved multi-use paths covering more than 20 miles through the south end of the city. They might not be the most scenic, but are a good opportunity to get in some long off-road miles. 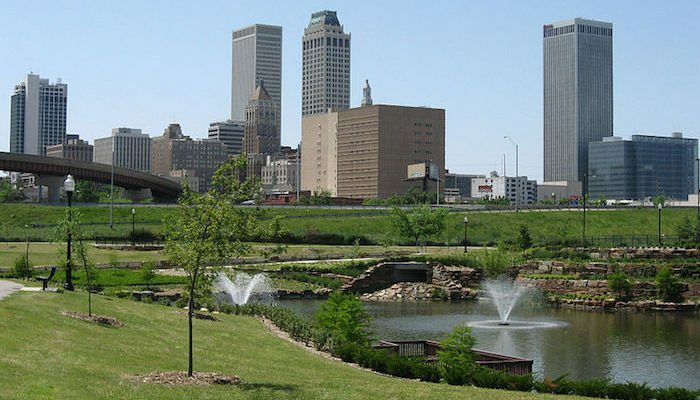 In addition to the River Parks and Creek Turnpike Trails, Tulsa has a large interconnected web of paved multi-use paths throughout the city and neighboring areas. See this list of runnable paths to find an option near you. 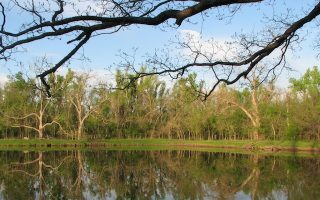 At 2,800 acres, Mohawk Park has plenty of open space for a run. There are about 10 miles of paved roads, a multi-use path, and several nature trails. 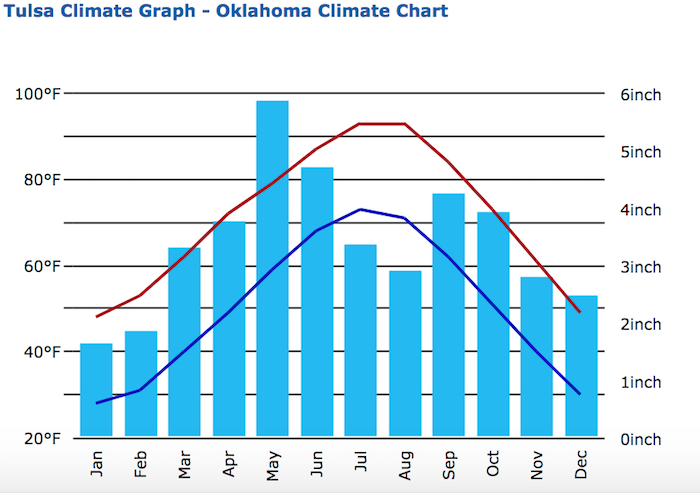 Tulsa has hot summers and cool winters. During the summer months, average high temperatures climb into the 90s (33-34C), and nights stay warm — please hydrate and consider running early! April, May, October, and November are great months for running in Tulsa. Winters are cool, with average high temperatures in the high 40s (8C), though lows regularly dip below freezing (there can be ice). Winters tend to be drier with only occasional snowfall, while the abundant rain in summer comes mainly through thunderstorms — this is the midwest — always good to keep an eye on the sky. Most Tulsa hotels are centered around the downtown area, but visitors can also find lodging around Broken Arrow, Jenks, Claremore, Sapulpa, Owasso, and Bixby. See VisitTulsa.com/Hotels for listings. If you stay downtown, there’s good access to most of our favorite Tulsa routes. Tulsa has several independent running stores, including RunnersWorld Tulsa, Tulsa Runner, and three Fleet Feet locations. RunnersWorld hosts group runs from the store Monday and Thursday evenings and Tuesday mornings. Trail runs from Turkey Mountain on Sunday morning. They also organize a variety of training programs throughout the year. Full calendar. Tulsa Runner holds a “6 at 6” (6 miles at 6 pm) group run on Tuesday nights and a weekly long run on Saturday mornings. Fleet Feet Three locations in Tulsa. in addition to hosting a variety of race events, runs training programs and “Track Tuesday” running groups. See this calendar. For more races and group runs, check out the Tulsa Running Club. They helped with many of the routes in our guide and are extremely knowledgeable about the Tulsa running scene! Oklahoma Sports and Fitness has a great list of upcoming running events in Tulsa and around Oklahoma.